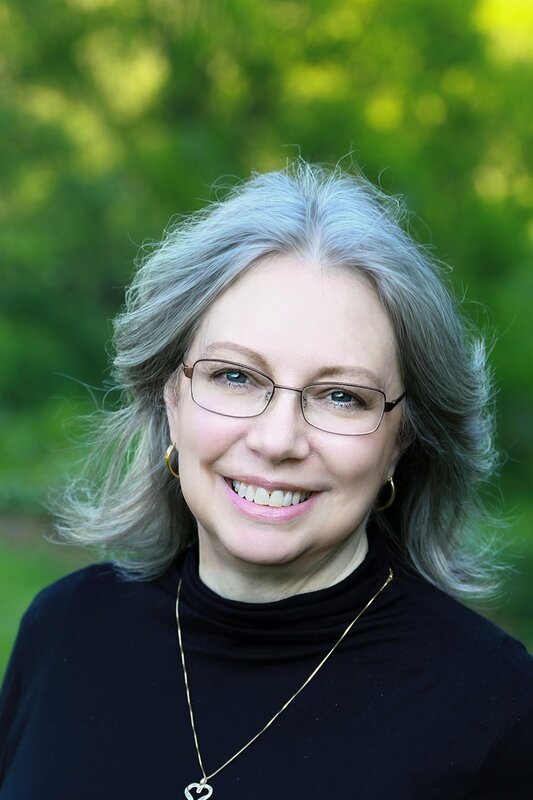 This blog article is dedicated to my sister Diana, who loves a good organizational project more than I do, and that's saying something! She's been waiting almost month for me to finish this room and to finally see some pictures. Last year, my dear hubby constructed a sewing room for me in the basement. It was the first dedicated sewing room I've ever had. I was SO GRATEFUL! Sewing, whether making quilts or garments, can be messy. Scraps of fabric and bits of thread (not to mention pins) find their way all over whatever room I'm working in. None of my projects are done in a day. Most of what I make are quilts, and they are lengthy projects--from planning to the final binding. 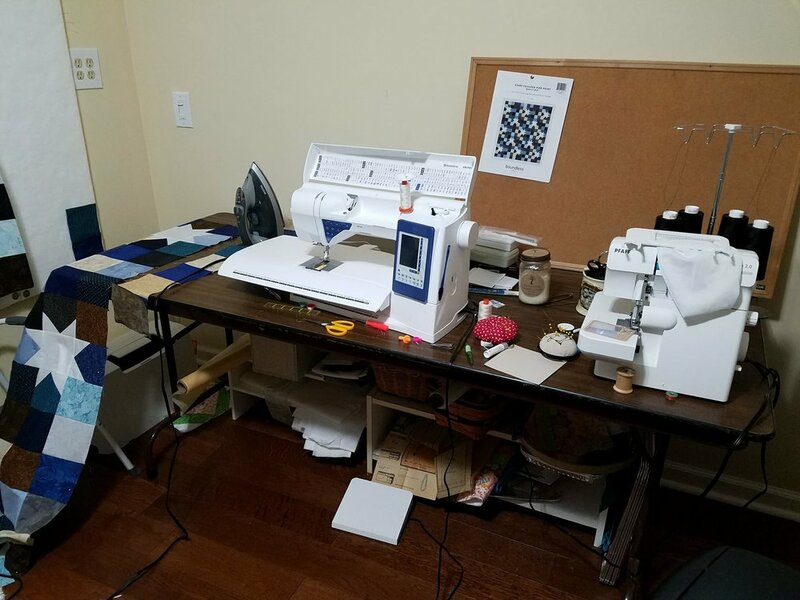 It's nice to have a space to set up my cutting mat, ironing board, and sewing machine, and leave it all right where it is. After hubby finished the room last year, I was ecstatic! I snatched whatever I could find around here to furnish it. I used old tables for sewing and cutting. I stored quilt fabric in a small white cabinet that I'd carried from house to house over the years. Shoe shelves that were made for closets were tucked under the tables to store things like "in progress" projects, and interfacing and patterns. My most used tools were stored on a rolling cart. Extra thread and needles and other numerous supplies, were stored in plastic drawers across the room. But things just got better! For my birthday, we bought Ikea furniture for the room, in white, to match the little cabinet. White is nice in a basement room--it reflects light. Now, everything matches, and I have things on hand. I'm happy with the results. There's something about having everything put away, out of sight, that calms my soul. It also makes being creative easier for me. I'm not shoving stuff out of my way all the time. Below are a few before and afters, as well as other pictures of the room. This is my new sewing area. Two Ikea drawers and a white Ikea countertop. I made the quilt pictures on the wall with cork and fabric. I can use them as bulletin boards. The lettering is a vinyl thing I bought. The table raises and lowers with a handle, so I have the option of using it as a regular table as well as a cutting table. The little cart underneath used to hold supplies. Now it holds current projects. The cabinet on the right, which I already owned, holds quilting fabric. The left is (obviously) storage. 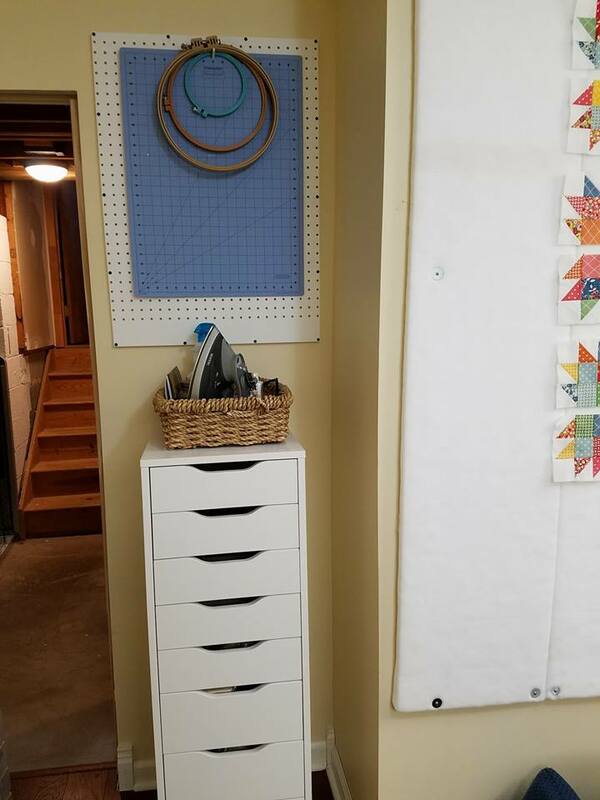 The Pegboard gives me a place to hang all the things I use at the table, including little containers of scissors, rotary cutters, and marking pens and pencils. And my cutting rulers are finally hung up. That wooden box on the floor is a light table that hubby made for me. I use it to transfer patterns onto quilt tops for quilting. I have drawers all over the place in the room now! Lots of storage. My iron and ironing supplies are in the basket on top. I use my iron all the time, so it's nice to have it so accessible. And when I'm not ironing, the ironing board rests between the wall and storage cabinet. We made this from foam insulation covered with quilt batting. As you can see, the pieces of a quilt stick nicely to the surface so I can lay things out before I sew. It's helpful to see how patterns and colors go together. That square framed star on the shelf was one of the first quilt projects I ever made--in the early 1980s. It was a pillow. It started showing wear, so I decided to frame it. I made the hanging applique mini-quilt, with all the orange, not long after I learned to quilt. That was back in the day when those colors were all the rage. I had it hanging over my sofa when my daughter was teeny. I recently completed the blue and gold piece using old nine patches from a quilt of my grandmother's, which was in near tatters. I saved a few of the good blocks and appliqued them onto backing. I look at that and think of her. The cross stitch pictures on the shelf were from my cross stitch stage--a few years before I began quilting. The wedding ring piece draped on top of the cabinet was a consignment store find--I love wedding ring quilts. Yes, I'm going to make one some day. I'm already collecting fabric to do so. The old sewing machine on top of the cabinet is obviously an antique. I'm sorely tempted to collect vintage and antique sewing machines because I love them, however, I'm going to. I don't have the room. Nice storage. Those are quilting gloves with rubbery tips. 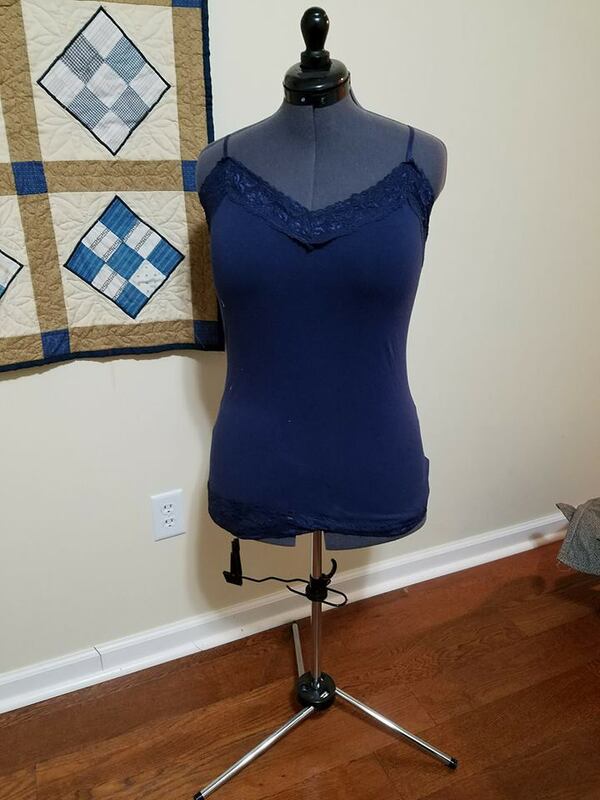 Makes machine quilting so much easier! My arms aren't worn out when I'm done. Lots of seam rippers! I think I have every one I've ever bought or been given. Now I can find all of them. 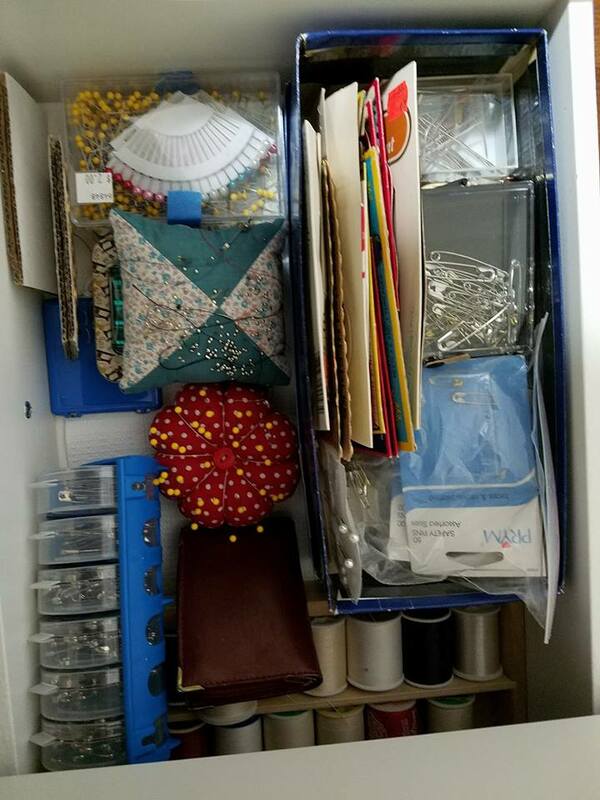 Regular sewing thread storage. I used kitchen drawer organizers for this. Yes, that's a lot of thread in the same shade. That's what happens when I don't know where everything is--I end up with duplicates. Now, that won't happen. Pins and needles. I've been collecting them for a long time, too. And that's hand quilting thread in the back of that drawer. I usually machine quilt. The cardboard shoe box belonged to my husband's mother. She was a seamstress, and I got a few things from her when she passed away. They came in that box. So, I wanted to use it. Finally, Miss Fidelia, my dress form.